Sometimes it helps not to have skin in the game. When the crowds converge on MetLife Stadium in New Jersey this Sunday, neither of my “home” teams (the Miami Dolphins or the New England Patriots) will be playing. That leaves me free to focus on what really matters on Super Bowl Sunday—without nail-biting partisanship—the food. But I’m rooting for both contenders with my menu, which features two dishes inspired by the Seahawks and the Broncos. Both are great party dishes and deserve a place on your Super Bowl table. From Seattle comes a classic of the Pacific Northwest: planked salmon. Inspired by the local Indian salmon roasts (where whole butterflied fish is pinned to cedar stakes and roasted upright in front of a campfire), planked salmon solves three problems that bedevil grillers everywhere. Thanks to the soaked cedar or alder plank, the fish stays moist; it never sticks to the grill grate; and it won’t break or crumble when you go to turn it (for the simple reason that you don’t turn planked fish). The plank imparts a subtle aromatic flavor (and makes a great serving platter). You’re looking at maybe 10 minutes preparation time, and like many worthy party dishes, you can serve 8 to 12 people from a single plank. From Denver comes a burger I created specially for the occasion: bison flavored with cranberries and pecans. If you’ve ever driven from Denver to Aspen, you’ve seen herds of American bison pasturing along the interstate highway—survivors of vast herds that two centuries ago carpeted the Great Plains and Colorado highlands. Bison burgers have a rich meaty flavor but are a lot leaner than conventional hamburgers. Don’t worry: You won’t miss the fat—not with a sweet/sour dried cranberry and pecan mix folded directly into the ground meat. Seahawks versus Broncos. 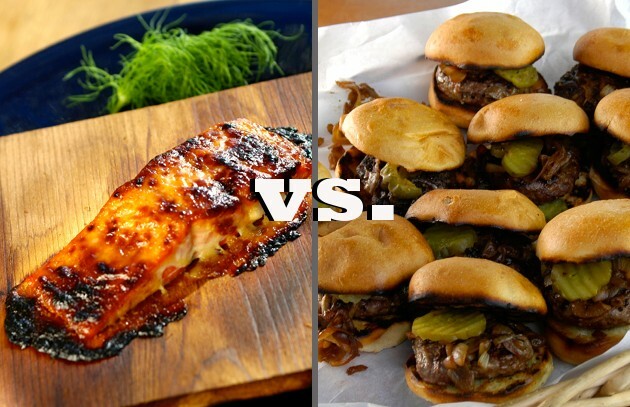 Planked salmon versus bison burgers. May the best team win.